Recommended for use in sets of 4 for ultimate traction, but at least should be used with other Winter/Snow Tires. I have one Blizzak WS-60 and one Blizzak WS-70 in stock if your looking for a cheap price on a pair of some of the best snow tires on the market. Blizzaks offer ultimate Snow and Ice Grip! Yes they really can stop on ice and get traction. The Blizzaks are a full step above a basic snow/winter tire such as the Firestone Firehawk which does not offer the ice traction of the Multi-cell compound that the Blizzaks offer which acts as a sponge to soak up that film of water that causes you to “slip” on ice. I’ve personally used Blizzak tires since 1995 and swear by them. 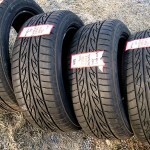 They are worth every penny in piece of mind and traction that will save you from accidents and damage that you’d probably not be able to avoid with standard all-season tires.